Beginner or experienced angler, practice trout fishing during your stay at camping Axat. 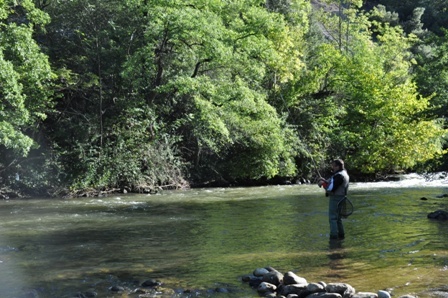 The River Aude is ranked 1st category with abundant fish population and especially trout and grayling. 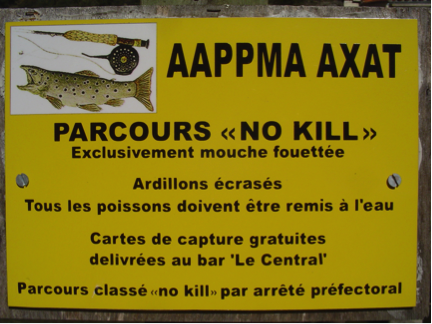 Each year, before the opening of the fishing association of Axat drop more than 300 kg of trout upstream Camping le Moulin du Pont d’ Alíes. Who can fish in the river? The practice of fishing is accessible to everyone from 8 years old. Il suffit de réserver la carte en ligne . You can also book your card upon arrival at your campsite Le Moulin du Pont d’Aliès . 800 m: the Rebenty , mountain stream that originates in the pond of the same name . 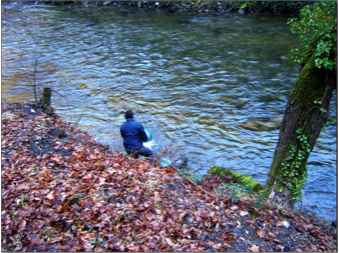 Its crystalline waters cascade down the steep mountain over 30 kms, great playground for brown trout that you can fish toc . The numerous rock cavities are all ” safe houses ” for lady brown trout ! The 1st category river whose water is very clear, will seduce you with its wild nature and the diversity of its landscapes , alternating small and narrow corridors and passages where fast waters stretch slow and calm , among the rocks. A good spot for lovers . River Fishing : follow the guide! Whether beginner or expert, you will have the opportunity to learn or improve your skills on the river fishing techniques . Yannick , monitor and guide state certified specialist fly fishing can accompany and advise you . He will be your guide to show you the best spots and open yourself to a practice of successful fishing and respectful of nature. A Axat , you also have a “no- kill” path of 300 meters, dedicated to the whipped fly with barbs crushed. To access the course , registration is free, it is done at the bar ” central ” which will give you a badge and a book of records of captures. A ” Scuds ” or Phaisant tail leaded -type tungsten get better results etchings . The sedge is highly appreciated by the presence of outbreaks tricho and imitations of different éphémères.Les ants are safe bets for beating the summer evening . Good fishing in the eastern Pyrenees Axat !